It’s important to understand, however, that this is hyperbole. Twain didn’t really believe in avoiding all adjectives and adverbs. His books have lots of them. He just meant to be judicious in the use of modifiers. That’s writing advice going too far. In fact, it’s ludicrous. 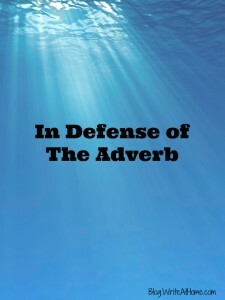 The adverb is often overused and misused for sure. As Stephen King points out, “He closed the door firmly” is no improvement over “He slammed the door.” Dressing up weak verbs with –ly words is no way to achieve dynamic, fluid prose. But adverbs are useful, sometimes essential words. We could probably do without very. At least, we could reduce its use by 90% and the world would be a better place¹. But where would we be without not, sometimes, yesterday, and later? We need adverbs. Some want to target just the -ly adverbs, but even those can be used effectively (see what I did there?). Would this lady’s editors and writing group really change “To boldly go where no man has gone before” to “To go where no man has gone”? Blech. Would these anti-adverbalists recommend deleting universally? How about Fitzgerald’s iconic final sentence of The Great Gatsby? Would “born back ceaselessly into the past” be improved by removing the word ceaselessly? Hardly. My tendency is to be suspicious of any universal rule when it comes to writing. Great writing always seems to defy rules. When it comes to adverbs, I suggest thinking twice and weighing whether it’s necessary or whether it improves or distracts from the sentence. Always consider choosing a livelier verb and eliminating the adverb, but if the sentence passes these little tests, leave the adverb alone. Comments? Don’t just leave them. Leave them immediately, boldly, and profoundly. Should, “every,” be struck from the list too? I know it’s a determiner, but it seems all too like an adjective, which I use too much. Seriously though, without adverbs and adjectives sentences would run like: “There was a chair. A man sat on it.” I think writing rules have a tendency to restrict amateur writers, which is every first time novelist. How do you know if you’re good enough to break the rules, if you don’t’ try? I think your last paragraph hits the nail on the head. It’s good to develop a habit of challenging adverb usage. That is the essence of King’s On Writing. A few adverbs will remain, the good ones. It’s worth noting that if every writer stringently adhered to the advice in Elements of Style and On Writing the world’s prose would be worse off. It would be as if we only had one narrator. We need different styles. I’m a fan of “On Writing” and, with some reservations, “Elements of Style.” But I agree — writers ought not feel bound by arbitrary rules, even if they come recommended by highly regarded writers.